Sitting here thinking about my new WIP, trying to bridge gaps, etc, and I suddenly come up with a brilliant idea. It fits in so well with my whole fantasy series, especially with one of the main books that tells the tale of a major event in my world's history, 'The Calming Of Gorthian'. For years I've seen this but never really twigged what it meant. 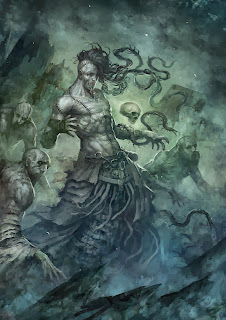 Recently I read 'Prince of Thorns' by Mark Lawrence and the art of necromancy plays an important role, and as I read the bridges between my gaps began to form. What an eye-catching pic! Necromancy is certainly a mysterious topic. It's great when you have an idea that makes certain pieces click together. Good luck with your series. Pictures like these make books fly from shelves - a milder form of necromancy perhaps.